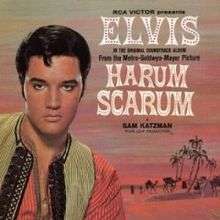 Harum Scarum is the twenty-fourth album by Elvis Presley, released by RCA Victor in mono and stereo, LPM/LSP 3468, in November 1965. It is the soundtrack to the 1965 film of the same name. Recording sessions took place at RCA Studio B in Nashville, Tennessee, on February 24, 25, and 26, 1965. It peaked at number eight on the Top LP's chart. Although 1965 had seen the release of Elvis for Everyone, a studio album which was actually recorded over a ten-year period dating back to Presley's first recordings from Sun Studios in Memphis, and a surprising worldwide hit with a five-year-old Gospel track, "Crying In The Chapel", it was back to the grind of making soundtracks. Elvis continued to grumble about the material and the continued pressure put on the stable of songwriters corraled by Freddy Bienstock — the writing team of Giant, Baum, and Kaye alone had provided 17 of 47 songs on the past four soundtracks in an eighteen-month period — but he soldiered on with as much grace as possible. In reality, almost any song could have been squeezed into the story lines, including old classics. But as long as sales continued, the formula required guaranteed control of publishing and new songs by the same songwriters. However, Presley's sales were plunging in music stores as well as ticket sales at the box office. Eleven songs were recorded for Harum Scarum, and all were used and issued on the soundtrack with two of the tracks omitted in the film. As with Roustabout, no singles were issued in conjunction with the album. A single was issued a month later, using the leftover 1957 track "Tell Me Why" backed with "Blue River" from the aborted May 1963 "album" sessions. In an onimous sign of things to come, it only made it to number 33 on the Billboard Hot 100, the lowest charting single of Presley's career to date. Elvis recorded "Wisdom of the Ages" on February 24, 1965 at RCA studios. It featured as a bonus track on the soundtrack album, along with "Animal Instinct", but did not feature in the film itself. The Jordanaires sang backing vocals. The film and its soundtrack are widely considered one of the lowest points of Presley's career. The song progresses from F major to B flat major, to D minor to E flat major to F major. ↑ "Harum Scarum - Elvis Presley". AllMusic. Retrieved 2016-05-11. ↑ "Pop Albums". Elvis Presley: Official Site of the King of Rock 'n' Roll. Elvis Presley Enterprises, Inc. 2013. Retrieved May 18, 2013. ↑ Jorgensen, Ernst. Elvis Presley A Life in Music: The Complete Recording Sessions. New York: St. Martin's Press, 1998; p. 201. ↑ Jorgensen, Ernst. Elvis Presley A Life in Music: The Complete Recording Sessions. New York: St. Martin's Press, 1998; p. 198. ↑ Jorgensen, Ernst. Elvis Presley A Life in Music: The Complete Recording Sessions. New York: St. Martin's Press, 1998; p. 417. ↑ Worth, Fred L.; Tamerius, Steve D. (23 March 1992). Elvis: his life from A to Z. Wings Books. Retrieved 11 June 2011. ↑ McLafferty, Gerry (1989). Elvis Presley in Hollywood: celluloid sell-out. Hale. Retrieved 11 June 2011. ↑ Matthew-Walker, Robert (1995). Heartbreak hotel: the life and music of Elvis Presley. Castle Communications. ISBN 978-1-86074-055-8. Retrieved 11 June 2011. ↑ American Film Institute; Munden, Kenneth White (1971). The American Film Institute catalog of motion pictures produced in the United States. University of California Press. p. 457. ISBN 978-0-520-20970-1. Retrieved 11 June 2011. ↑ Cotten, Lee (21 July 1987). The Elvis catalog: memorabilia, icons, and collectibles celebrating the king of rock 'n' roll. Doubleday. p. 120. ISBN 978-0-385-23705-5. Retrieved 11 June 2011. "Follow That Dream releases". Elvispresleyshop. Elvis Australia. 2015. Retrieved January 24, 2015. "Harum Scarum". Shopelvis. ABG EPE IP LLC. 2015. Retrieved January 24, 2015.